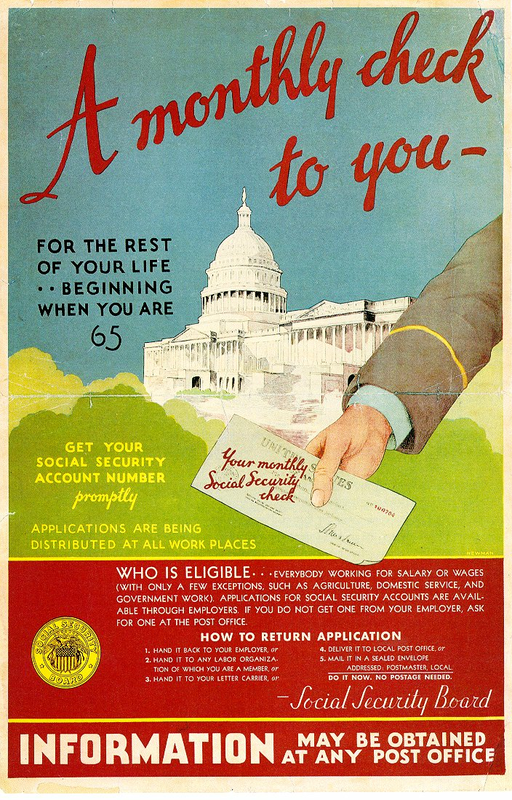 The Social Security Act of 1935 started a national old-age pension for workers who earned wages. This meant that at age 65 these workers could retire and receive monthly payments from the government. To pay for this program, workers and employers each paid money into the fund. The Social Security Board distributed this poster in 1936 and 1937 to publicize and explain this new program. Cite This document | U.S. Social Security Administration, “"A monthly check to you",” HERB: Resources for Teachers, accessed April 20, 2019, https://herb.ashp.cuny.edu/items/show/2020.